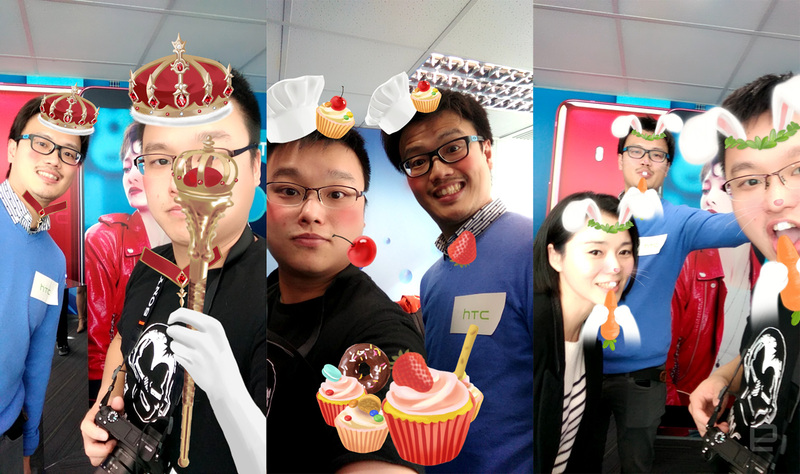 It's basically a cheaper U11+ but with more fun features, like AR stickers for selfies. Well, that was quick: HTC's promised return to a dual-camera smartphone is already here. Meet the U11 Eyes which, as the name implies, is a selfie-centric smartphone featuring a pair of cameras on the front. These deliver live bokeh effect which supports re-focus after capture -- just like the good old days with previous dual-camera HTC phones. And yes, the U11 Eyes reuses the same shiny "Liquid Design" as the flagship U11+, but swapping out a few flagship-level features for a more affordable price. You'll find an octa-core Qualcomm Snapdragon 652 chipset (which is approaching two years old), a 2,160 x 1,080 LCD instead of QHD, just three microphones instead of four (so no acoustic focus when using zoom in video recording) and no BoomSound speakers (so no stereo nor "Hi-Fi" output). That said, you'll still find a handful of familiar goodies, including the excellent 12-megapixel f/1.7 main camera (with O.I.S. and 4K video recording), Hi-Res audio capture, USonic self-tuning earphones, Edge Sense squeeze input, a generous 3,930mAh battery and the U11's IP67 water plus dust resistance (the U11+ has IP68). The easiest way to tell a U11 Eyes and a U11+ apart is by looking at the ring around the main camera: the former has a thinner and shinier ring, which is the most apparent on the Solar Red version -- the gold ring combined with the glossy red body would definitely get a seal of approval from Iron Man. 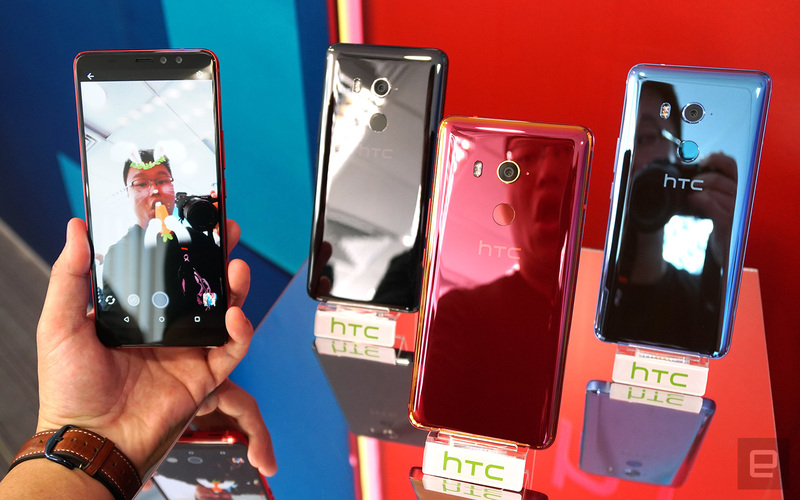 Both the U11 Eyes' front cameras come in at 5 megapixels with f/2.2 aperture plus a wide 80-degree view -- a somewhat disappointing choice compared to the original 8-megapixel f/2.0 imager with 85-degree capture, but perhaps HTC couldn't fit larger sensors here due to its design choice. Still, they benefit from the same HDR Boost function as the UltraPixel 3 main camera, and the single camera -- the one by the earpiece -- responsible for video recording can record up to 1080p. In addition to live bokeh, the camera's selfie mode also supports live beautification -- you can either use auto mode or go manual with options for skin smoothing, skin brightening, face slimming and eye enlargement. But what really got me hooked were the AR stickers for selfies. 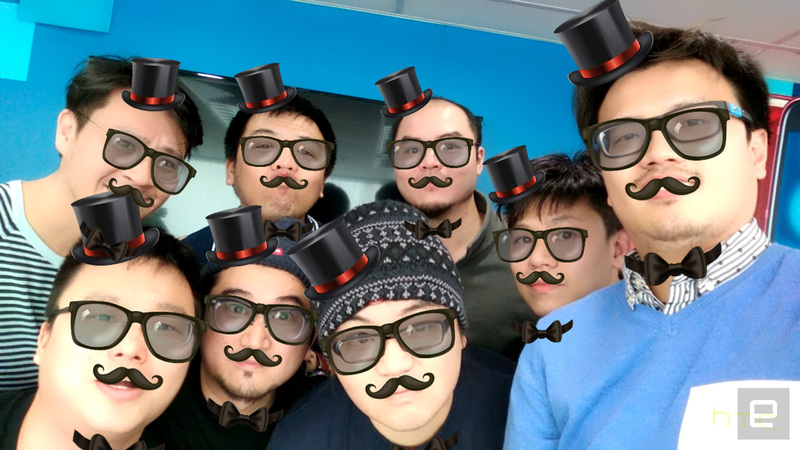 Taking a page out of Snapchat and Facebook's, um, books, HTC is offering a set of cartoon animations -- be it a hat, facial hair, sunglasses, foods, bunny ears and more -- that automatically map to everyone's faces within the canvas, so long as the faces are large enough to be recognized. At one point, we crammed eight people into a group selfie and the camera still managed to turn us into a bunch of teenagers make us all look cuter. AR stickers are actually available to both the front and back cameras, but they are limited to still photos. There are apparently still some kinks to be ironed out, so AR stickers won't land on the U11 Eyes until some time before mid-February -- it'll arrive as an update via Google Play. While this feature only requires a single camera, HTC says it currently has no plans to add it to its other U11 devices. Joining the likes of OnePlus and a few other Chinese smartphone makers, HTC is also jumping on the face unlock hype train with the U11 Eyes. Again, using just a single camera, the camera looks out for 128 feature vectors on a face, and it can somehow distinguish between a real human face and attempts with still photos or video clips. It's also able to recognize its owner if when he or she puts on a hat, sunglasses (to a certain extent of darkness) or even a breathing mask -- an item popular amongst scooter riders in Taiwan. As a bonus, this method can be paired with Edge Sense unlock: simply squeeze the dormant phone while looking at the front camera, and you're good to go. It should be noted that this face unlock is more for the sake of convenience, which is why this face unlock option isn't available for authorizing mobile payments -- you'll still have to tap the rear fingerprint reader or type in your password for that. Interestingly, this is one feature that HTC is considering to roll out to other U11 devices, so stay tuned. 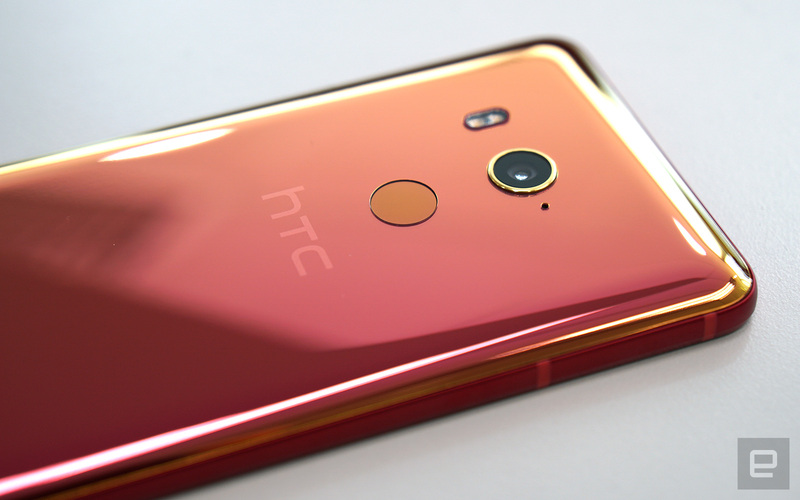 It's unclear as to when the U11 Eyes will be available in markets beyond Greater China, but for those who happen to reside in that region, the 64GB model with 4GB of RAM be available for HK$3,898 or about US$500 in Hong Kong as of this Wednesday, and you'll get three familiar color options: "Solar Red," "Amazing Silver" (which is more of a shiny blue) and "Ceramic Black." According to our local sources, the price may actually hit HK$3,200 or about US$410 on launch day, which is more acceptable for a phone powered by a chipset from 2016; but then again, maybe the fun cameras combined with a unique design will justify this for ordinary users. Either way, it won't mean much without some serious marketing push or miracle work, especially in Mainland China where it's been struggling to return to top five for years.